HNA Group Co., the Chinese conglomerate and parent company of Hainan Airlines, has increased its stake in Deutsche Bank AG to almost 10%, overtaking Blackrock Inc. as the top shareholder in Europe's largest investment bank. According to a Bloomberg report, HNA's holding in Germany's biggest bank rose to 9.92%. The conglomerate initially reported a 3% stake in Deutsche Bank in February and disclosed a stake of almost 4.8% in March. The Chinese conglomerate has spent US$30 billion on deals over the past year. Led by billionaire Chen Feng, 63, HNA was founded in 1993 as Hainan Airlines, in the southern island province of Hainan, with help from the local provincial government. It has since expanded considerably into several industries, and now has more than US$90 billion in assets in companies ranging from airlines to hotels and from banks and aircraft leasing companies to airport handling firms. In March, the HNA Group has agreed to buy a majority stake in Frankfurt-Hahn Airport in Germany for €15 million as part of its drive to expand its transportation portfolio. 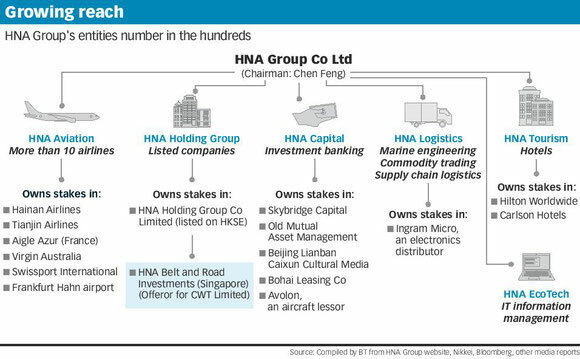 Last month, HNA offered S$1.4 billion (US$1 billion) to buy Singapore’s logistics and commodity company CWT Group and a recent Reuters report said that HNA is also in talks about buying the publisher of Forbes, the U.S. business magazine, and German shipping financier HSH Nordbank.